Network Members - This is the easiest way. Customers who want to access computers get a so-called 'Network Member' account. They can purchase computer access time which is credited to their account. This computer time can be used on any computer in your business in as many sessions as the customer wishes. The work of the administrator mainly consists of selling the computer access time. The rest is done by the TimeWatcher software. 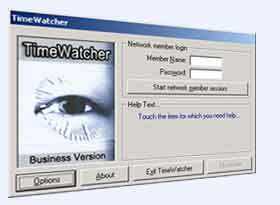 The TimeWatcher Network - If the supervisor wants to have more control over the computer usage of your customers he can lock and unlock the computers over the network. The Direct Access Codes - For smaller businesses which don't have their computers connected over a network we invented the Direct Access Codes. The supervisor just hands out codes to the customers, which are good for a certain amount of access time on a certain computer in the business. Whatever method you choose, TimeWatcher will always make sure that the customers will get exactly the amount of computer time they paid for.